It was 2014 and the folks at Earthquaker Devices had done something they said they never would. They created an overdrive based on the TS808 – that classically copied circuit beloved by everyone. No one could say there weren’t enough clones of the TS808 on the market. No one could even say that there weren’t enough variants of the TS808 on the market. But, what you could say was that EarthQuaker hadn’t tried their hand at its own rendition of the classic. When they did – no one was complaining. 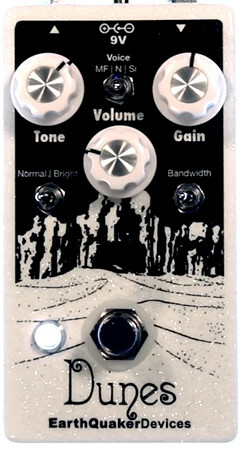 The Dunes is a condensed version of our highly popular Palisades; a heavily featured take on the classic 808 overdrive. It features the same Gain, Tone and Level controls along with our favorite voice and bandwidth settings as well as the “Normal/Bright” toggle. The selectable voices are: “MOSFET” for a tight crunchy sound (Setting 3 on the Palisades), “Silicon” for the classic 808 sound (Setting 5 on the Palisades) and “None” which goes from clean boost to gritty, pure opamp distortion with a massive volume boost (Setting 1 on the Palisades). The two bandwidth settings are “stock” for the classic tone (Setting 3 on the Palisades) and “full range” for more low end (Setting 5 on the Palisades). The Dunes has all the great tone of the big boy Palisades but with a simplified interface and a smaller footprint! Sounds like a great new pedal to add to our list of options. Let us know if you get close enough to smell this effect and don’t hesitate to let everyone hear about your experience at Pedal Finder. Here’s a video with the rundown on The Dunes and some other EarthQuaker Devices.